PeaceQuest partner, Canandian Voice of Women for Peace is involved in holding three peace camps across Canada in August and September. Registration is now open! Have a look at the event descriptions and posters below. We hope to see you there! Monday, August 24 – 28 – Outside of Nelson BC. 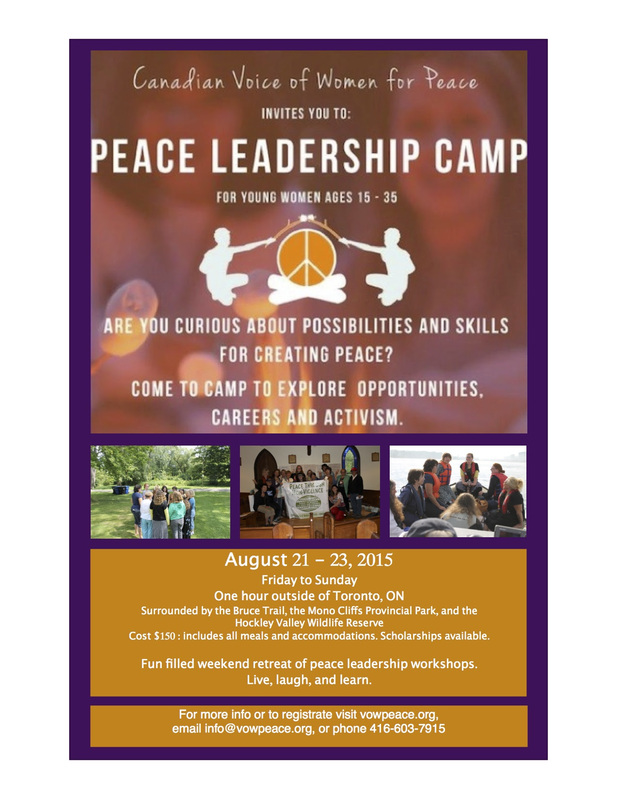 Curious about careers and activism in peace? Come to camp to meet amazing women, explore local and global opportunities, network to create and support future projects and enjoy the beauty of Kootenay Lake. British Columbia Summer Camp 2015 near Nelson, B.C. PeacemakeHers Young Women’s Camp, September 18, 19, 20, 2015 a project of the Nova Scotia Voice of Women for Peace, a chapter of the Canadian Voice of Women for Peace, which endeavors to create opportunities for learning and collaboration in peace leadership for women in the Atlantic Region. « Nuclear Weapons: What have we learned? » Regina: Jane’s Walk, Peace Walk Success!